This is a poncho I designed myself. Pretty basic, but from this pattern on I altered and made my own Ponchos! 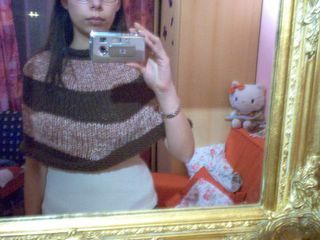 A little warning if you want to do this poncho you might use different decreases then I did plus do less decreases. As you can probably see in the pictures my decreases are very much visible, which is the way I intended it to be! Change color and knit 3 rows. Change color and knit 5 rows. Change color and knit 2 rows. knit 2 rows and bind of. 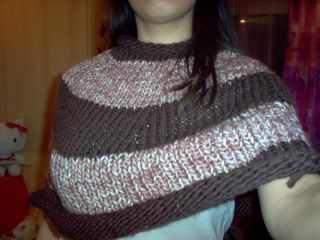 I used k2tog(knit two stitches together). I spaced them in such a way over the rows, that the decreases where above one another forming that dart like thing you can see in the pic. Hope that helps! If not feel free to ask again. please please do let us know what kind of decrease you used-- can you post it here? The gauge tells you the number of stitches and rows per 10 cm. You shoul always make a gauge swatch before you start a new project to determine which needle size to use or if you have to recalculate the stitches in the pattern. hello there... whats up, dawg?? i love ur site. it is like the best site for beginners! can u please tell me what gauge is?? ?